When an individual bacterial virus grows in a bacterial host suspended in a top agar lawn, its progeny infect and lyse the surrounding host cells. This causes the appearance of a “hole” or plaque in the otherwise homogeneous bacterial lawn. Since each plaque represents a single virus, the number of viruses in the aliquot added to the plate is equal to the number of plaques which appear. 2. Prepare a dilution of the phage such that there are about 10^3 particles per mL (usually a dilution of 10^6: 10 uL into 10.0 mL, repeat a second time). a. Pipet about 2 mL of melted agar into sterile capped 13×100 mm tubes in 45°C hot block. b. Pipet about 0.1 mL host bacteria (E. coli B) using a 1.0 mL pipet into melted agar (down the side of the tube is OK). 4. Add phage: Pipet 10 uL or 100 uL of 10-6 phage into the host-inoculated tube (deliver with care, just below surface of agar). 6. Pour out and distribute over a pre-warmed agar plate, immediately tilt back and forth to evenly distribute before it begins to gel. Let sit undisturbed until gelled. 7. When gelled (1-2 minutes), invert plates, incubate ON at 37°C. 8. Count all plaques, record data, calculate phage particles/mL in the original culture. Bacterial viruses have proven extremely valuable in the study of the mechanisms of DNA functioning. Their short life cycle (as short as 30 minutes) combined with their large number of progeny from each cell which is lysed (up to 400 phage particles/cell) allows the production of large numbers of progeny in a short amount of time. Their growth is also an excellent model for how mammalian viruses infect and reproduce. The previous day, inoculate a small volume (about 1-2 mL) of nutrient broth or tryptone soy broth with a sensitive host (E. coli B for T4 phage). Grow overnight (ON) at 37°C in hot block without aeration. The next AM, using the same set up as you did for the bacterial growth curve, prepare a mid log phase culture of E. coli B by adding 0.1 mL of the ON culture to about 4 mL of tryptone soy broth, and aerate at 37°C in hot block. Aerate until it is barely turbid (A660 = about 0.100), about 1 – 1½ hours. 2b. The mid-log culture should be barely turbid compared to uninoculated tryptone soy broth. 4. PURIFY PHAGE PROGENY: The culture should lyse in a bout 1 to 1 1/2 hours after inoculation. Evidende of this will the a dramatic drop in the A660 in the culture. Spin down the bacteria in the original culture tube for 10 min in a balanced clinical tabletop centrifuge at setting 5. Decant the supernatant into screw-capped culture tube, add a few drops chloroform (~0.3 mL), shake, label with name of mutant phage, your initials and the date. Store at 4°C in the refrigerator. This dissection should be done in three phases. Make a full page illustration for each phase showing each region: the cuts made, the locations of the italicized features, and the nerves listed. 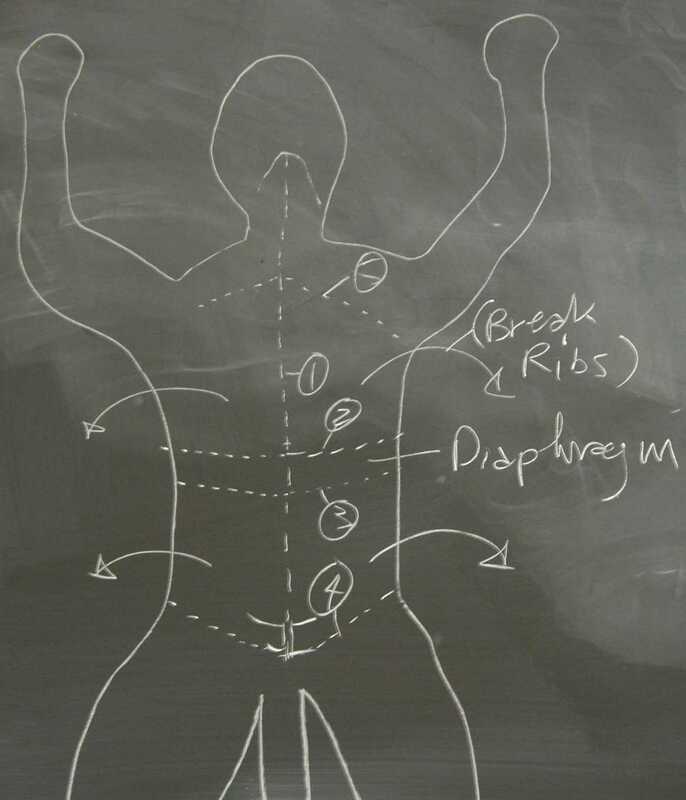 OPENING THE ABDOMEN: Pinch the ventral abdominal wall to produce a transverse fold. Snip with heavy scissors along the linea alba so that you nick the wall longitudinally. (Alternatively, use the cut made during latex injection.) Carefully insert the blunt end of the scissors into the nick and lift thesuperficial layer of abdominal muscles away from the underlying organs. Snip down to the pubis. Extend the cut up to the sternum, again taking care not to damage the underlying organs. Make two transverse cuts in the abdominal wall on each side 1) just inferior to the ribs, and 2) at the pubis (don’t cut vas deferens). Reflect the two abdominal flaps exposing the underlying organs. OPENING THE THORAX: Slip the blunt end of the heavy scissors under the xiphoid process, lift and cut through the sternum all the way to the jugular notch. Keep the angle of the blunt tip shallow to avoid underlying organs. Insert the finger into the thorax just above the diaphragm, feel for the point of attachment just inferior to the ribs. Make lateral cuts to free it from the lower rib cage. Spread the thoracic walls. You need to crack some ribs at the vertebral column to get a good view. Note the mediastinum (the space between the lungs) contains the heart, its pericardium, the great vessels, the trachea and the thymus. 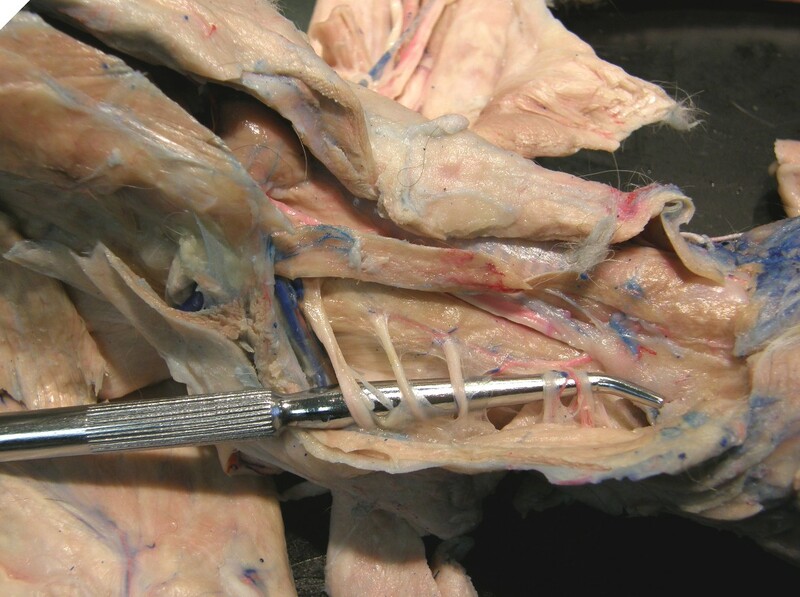 Preserve connections of the vessels of the thorax for the cardiovascular lab studied next quarter. NECK: Extend the cut up to the chin. Neck muscles adhere tightly to underlying organs. 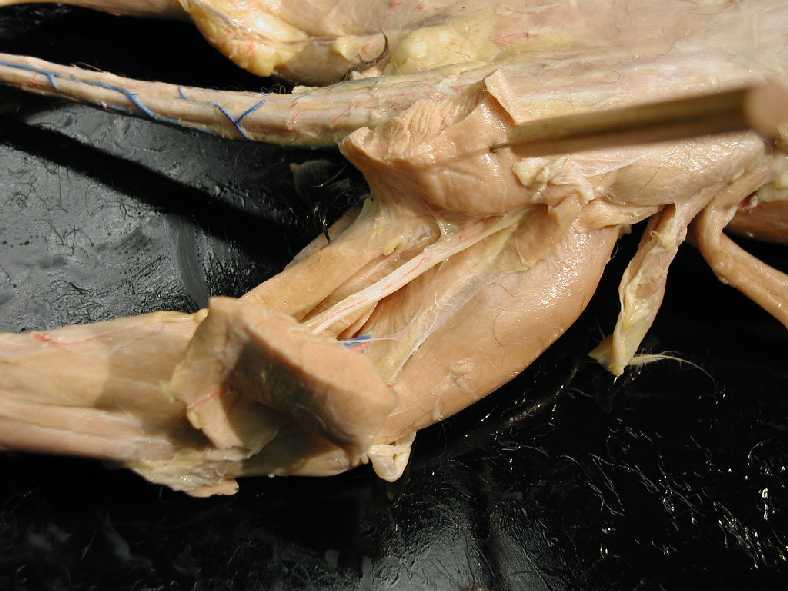 Cut and reflect the superficial muscles to expose the larynx. Along the sides, push (with some force) the outer wall of the neck to separate the superficial from the deep neck muscles (probe deeply) but do not sever the nerves. Cut the muscles just below the mandible so that you can turn out the flaps. 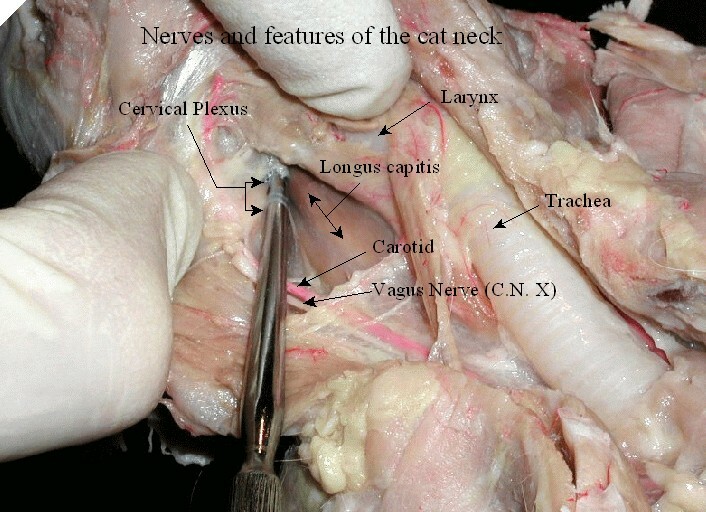 Here is a labeled view of the nerves ant features of the neck. 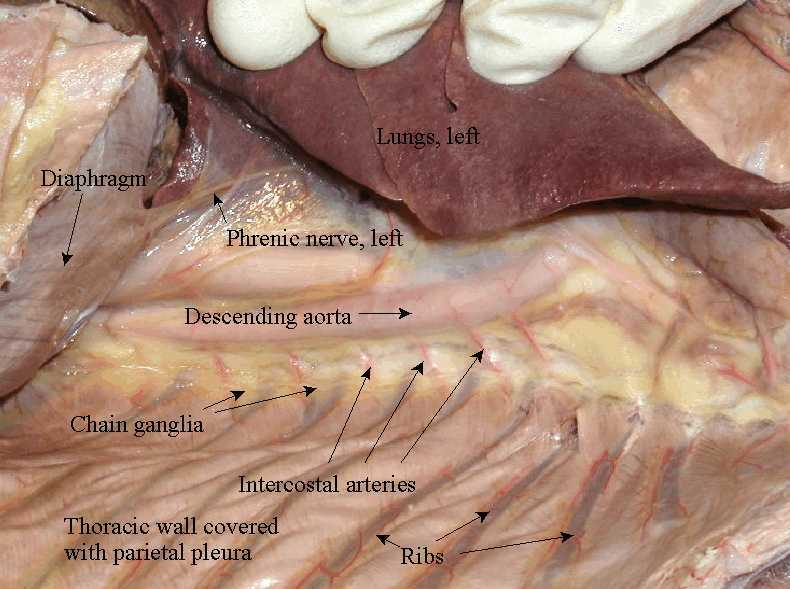 phrenic: There are R & L phrenic nerves, easily seen at diaphragm, attached to vena cava on R, in pleural folds on L. (p 69) They emerge from the fifth and sixth cervical nerves. Here is a labeled version of the thoracic cavity with chain ganglia. 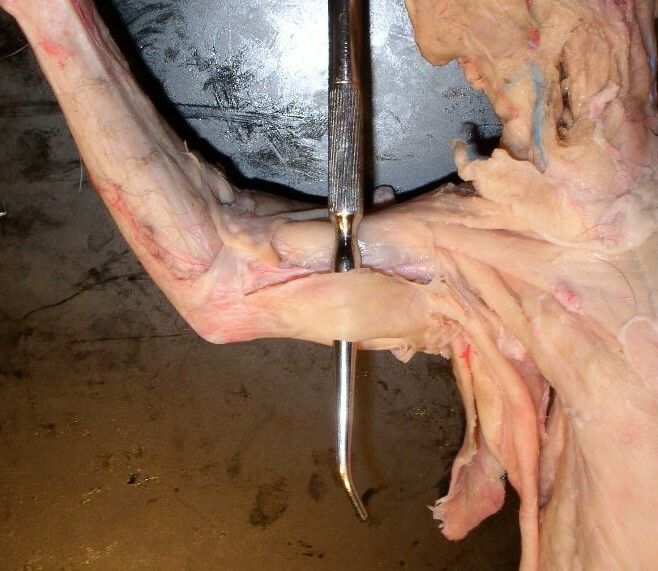 radial: This is the largest nerve emerging from brachial plexus, soon plunges below biceps brachii about half way down the arm. 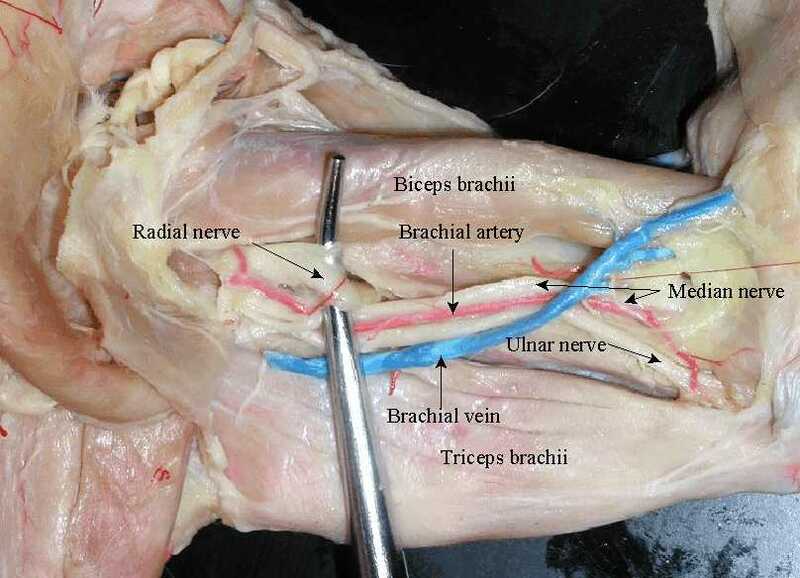 Here is a labeled image showing radial, ulnar and median nerves. median: This is the smallest of the three nerves, lies between ulnar and radial nerves, follows the brachial artery into the forearm. sciatic: The largest nerve in the body, it descends the latero-posterior thigh under the biceps femoris, branches to form several nerves of the leg. 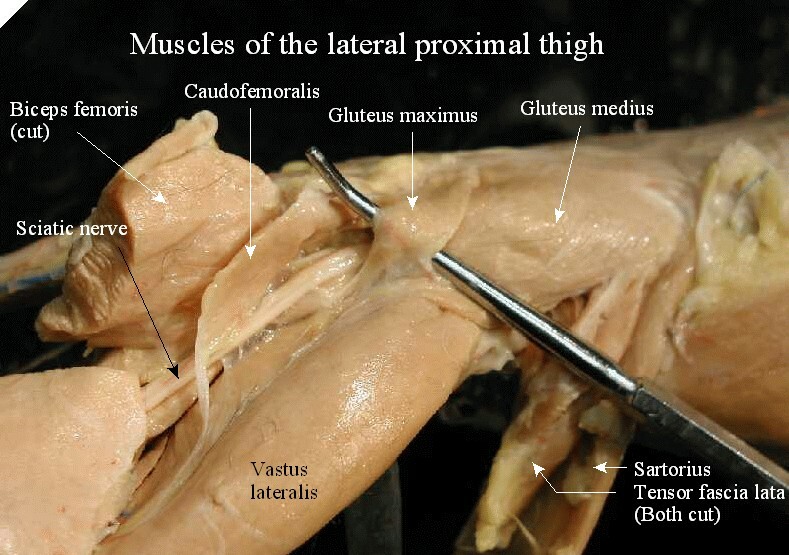 Note the muscular branch of the sciatic coming off at the L of the view. 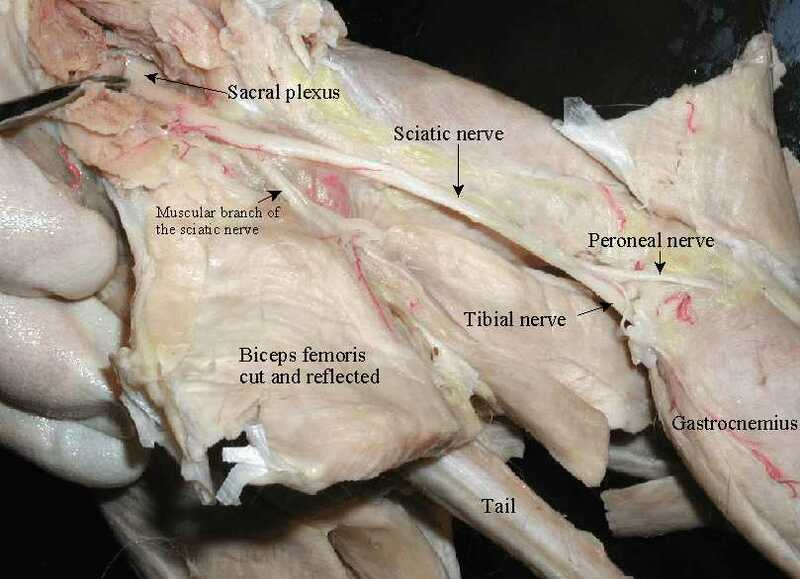 Here is a labeled view of the sciatic nerve, sacral plexus, tibial and peroneal nerves. 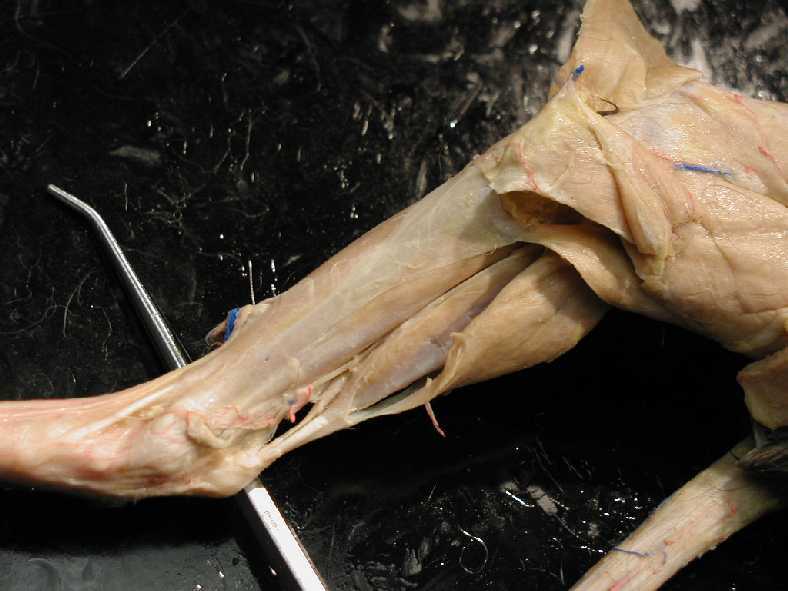 Tibial: The larger of the branches of the sciatic, plunges between the heads of the gastrocnemius, supplies lower leg. The second illustration is labeled. CLOSING UP: As always, when you have finished for the day, replace the internal organs in their proper locations, close the cat, wrap in its skin, place in the plastic bag, press out the air, seal with three turns of a large rubber band and return to the box with number to right. Wash your desk top with warm soapy water. Wash your instruments well, dry them, replace the kit in the storage box. Check the sinks and the floor around your desk to be sure they are thoroughly clean. 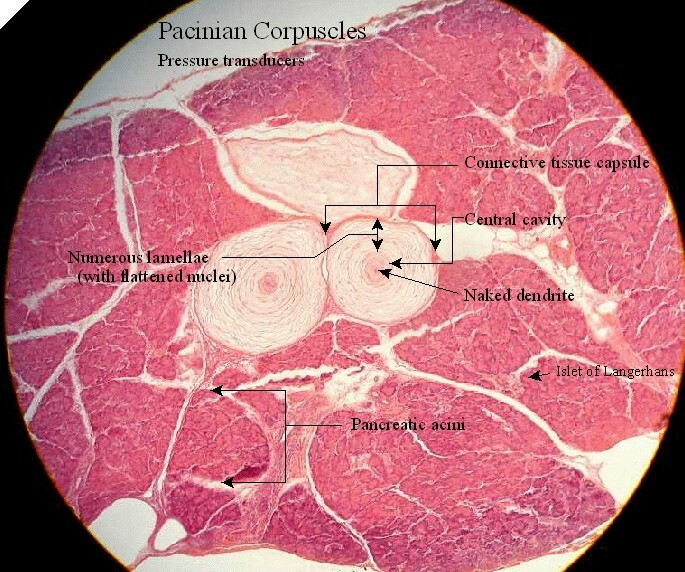 Of the nerve endings in the perpheral nervous system, the most highly developed are those which detect pressure and vibration in an organ, the Pacinian corpuscles. We will be looking a sections of pancreas which display these features.